This is a common problem, when riders first change from always being in a deep three-point to a two-point. 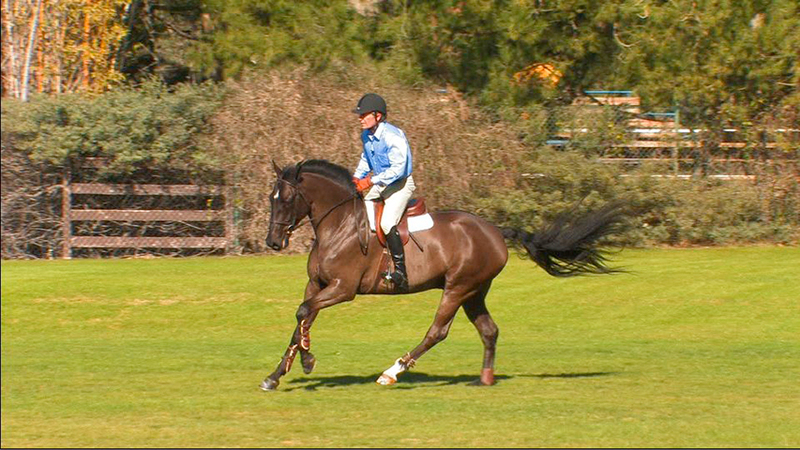 Try this exercise; canter on a large circle, put yourself in a two-point, then practice increasing and shortening his stride (ask for very small increments of change at first), all while maintaining a two-point. Cheat a little at first when you bring his stride back to you…put your knuckles on his neck, close your fingers as if you were squeezing water out of a sponge, and close your knees into his shoulders to bring him back. 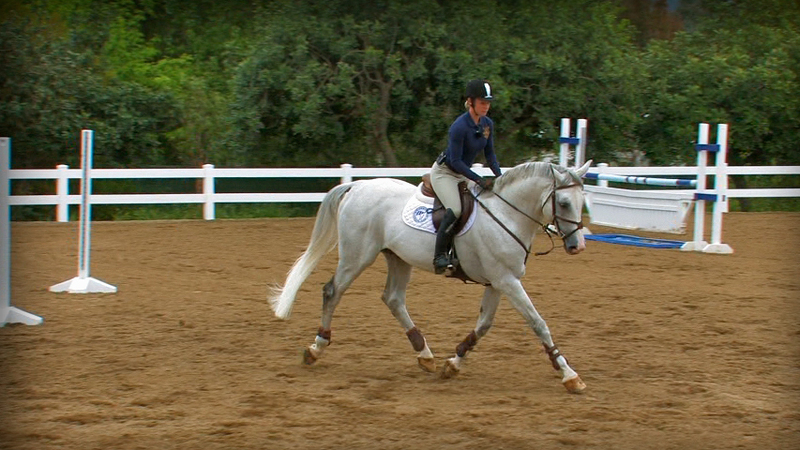 Riders usually make the mistake of closing their heels to slow down and halt. Close your fingers, soften your heels, and squeeze your knees and the outside of your thighs into his shoulders to slow down, then open your fingers and close your heels to increase his stride. Once he gets the idea, you should eventually be able to halt, walk, canter depart, increase to hand gallop, bring him back to canter, and then halt…all while maintaining your two-point. Keep the sessions short at first, as you may find that this exercise requires more fitness than you might have thought. For your reading homework, study Bernie Traurig’s excellent article on this topic in last winter’s Practical Horseman. Click here to view it. 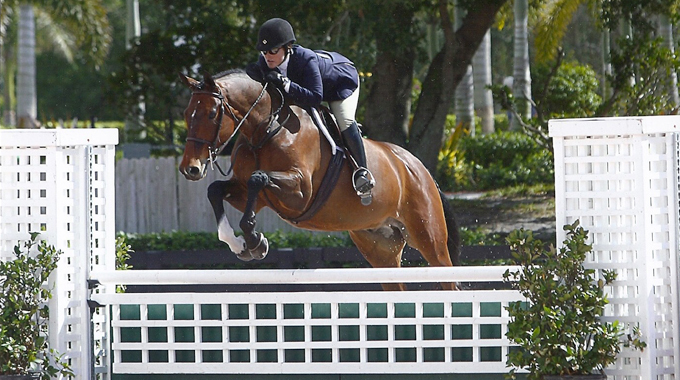 To be a competent jumping rider, it is essential to have a position that allows effortless transition between a deep, potentially strong seat to an extremely light, essentially neutral seat—and all degrees between. 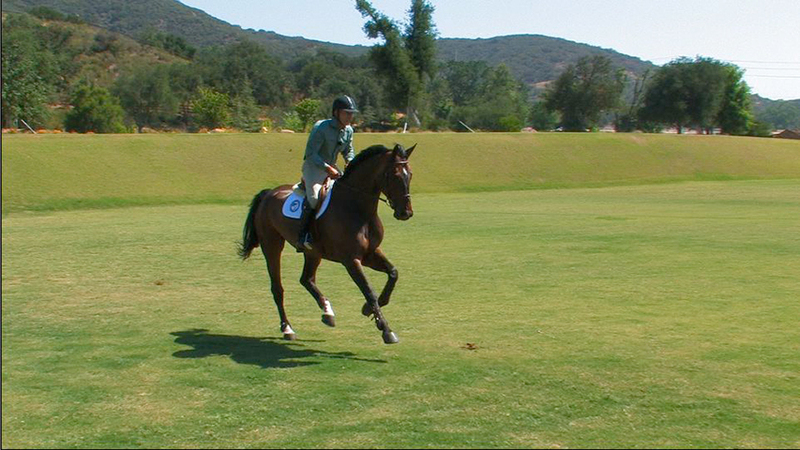 For jumping, the go-forward aid is almost exclusively your leg, perhaps with an occasional cluck to add emphasis. A driving seat in front of a fence is only used in case of an absolute emergency situation, as it will always result in an uncomfortable connection with the horse when he leaves the ground. If your horse needs a driving seat to get him to go forward, then he needs to work on the basics until he is ready to move forward immediately and reliably from leg aids alone. I firmly believe that the less the rider needs to ‘do’ in the final couple of strides, the better the jump will be. The rider should set up the approach ahead of time by organizing the precise track, the appropriate pace and degree of impulsion necessary, and by establishing a rhythm that will remain constant to, and after, the fence. Then, perfect or not, do NOTHING other than maintain what you have in the final strides. Over most obstacles, this excludes maximum efforts over large fences, your horse should be able to fine-tune his final preparations and execute the jump on his own. In almost every case, only very experienced riders, who have exceptional feel (developed by jumping literally hundreds of jumps every week on many horses over many years) are able to truly help a horse by changing anything in the last 2-3 strides. More often it results in that terrible miscommunication that we call a “chip.” If this is repeated often enough over all but the tiniest jumps, it usually turns into random or frequent refusals as the horse loses all trust in the rider. 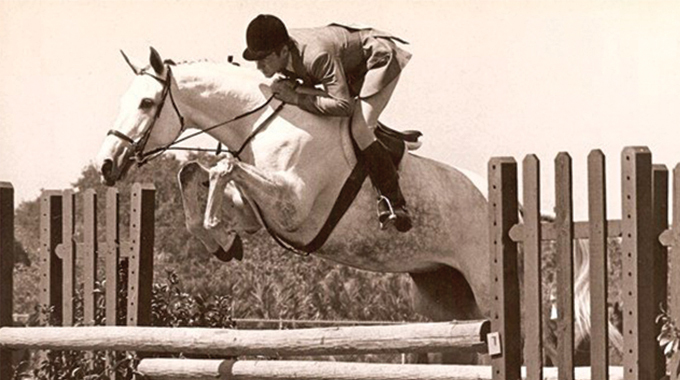 I have found that the rider’s upper body position is of little import, provided that the horse is consistently in front of the rider’s leg and the rider is able to maintain an appropriate, balanced seat until the horse is safely airborne. Shoulders well in front of the hips (the so called American Forward Seat), or shoulders closer to directly over the hips (without driving the horse forward), or somewhere between, is more a matter of aesthetics/personal preference/accepted style for the discipline. While it is human nature to try to emulate those successful athletes you most admire, don’t fall victim to copying only their most obvious and/or unique mannerisms. These are not what their success result from. Instead search for the oh-so-hard to see subtleties of balance, focus, control, and level of communication between horse and rider. 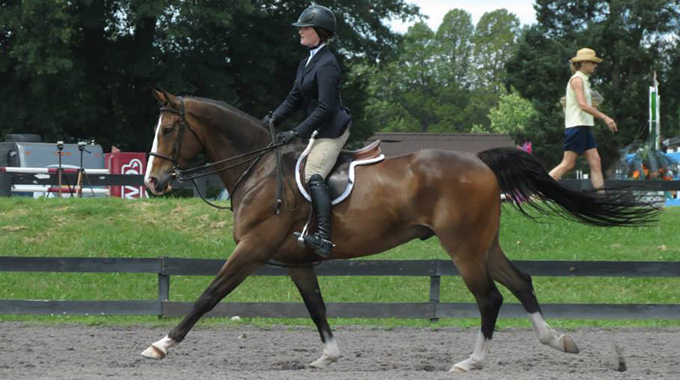 Leave the little quirks—an elbow out, a pivot of the lower leg, or a rather extreme upper body position—to those that have spent years fine tuning those nearly invisible elements of impulsion, balance, and timing. There is a reason to pursue the middle ground of classical riding: it has proven most effective for nearly every rider, year after year, and decade after decade. 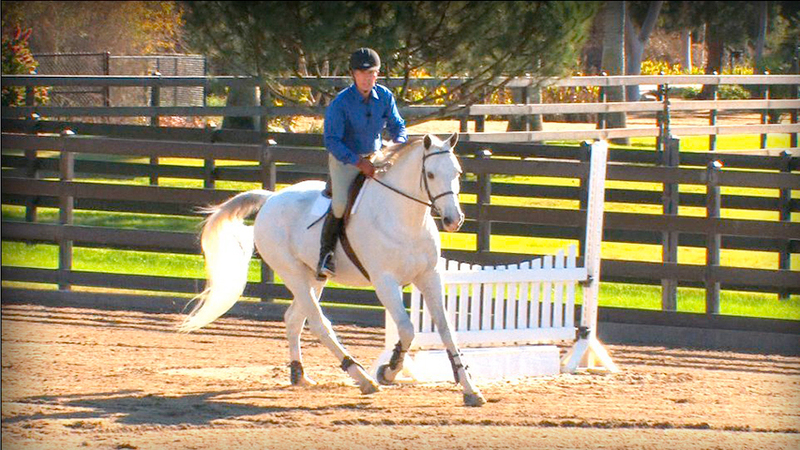 Geoff explains the importance of Equitation for riders in all jumping disciplines. 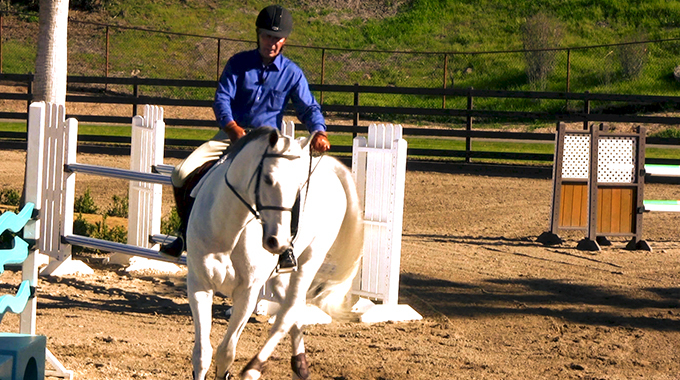 Geoff Teall helps a member who is finding it hard to get her mare to turn (the neck goes but the body doesn't follow).